First, my apology to Gitane15 as I kind of stole your thread 2 weeks ago. In 2011 I purchased a Gitane frameset-fork assuming it was as noted on E-bay as a S.C. with an obvious repaint that had been parted out of all the Campy and/or components. I briefly inspected the bike to see that it had not been damaged in shipping. BUT This SuperCorsa frameset & fork have sat quietly in the basement the last 6 years. I had several bike-touring campouts with the young men in our Scout troop this year. It got me thinking about building a touring bike from this frameset. My intent to set this up as a possible Triple touring bike, BUT as I've started to strip the frame (which seems suspiciously heavy for Reynolds frameset) it became obvious that possibly this is a different replacement fork. A 60 cm frameset with no sign of Gitane Red ---but a fork that did have original Red finish. so I have no idea what kind of headset it had been using but obvious not the Campy that one would expect on a SuperCorsa. I don't want to try to gain the 3mm difference by machining the headtube and crown race seat (my LBS has some VAR shop tools for facing the headtube but not the correct tool size for modification of the crown height and I.D. size). I am, "Getting Old and Grey"
" I Still Like Steel "
Lofter, Don if your out there besides Facebook, what paint did you use on the "87 Professionel that you posted yesterday? Do you have close ups of the other lugs on the bike? Does it appear to be a Reynolds frame but cro-mo fork? Classic bikes can be a lot of fun but the challenges on some of these can also be frustrating. I've used the VO bottom brackets on three bikes with a lot of luck but with them being symmetrical it has been a little tougher to determine exactly what length is appropriate for a good chain line. I thought I had it figured out on one and then the inner chain ring ended up touching the chain stay and I had to go a different route. My touring bike right now is a drop bar conversion late 90's Peugeot hybrid. It's a little heavier but came with cantilever brakes which I wanted. And, it rides straight and is solid on downhills. Would this bike be better served as more of an errand/yard sale bike? Reading between the lines makes me wonder if you are second guessing making it a touring rig. G'day, thanks Scott ( I will admit I am giving some thought to just purchasing a Bike Nashbar touring bike that is on sale right now. Modern components, the cantilevers, and the correct frame mounting hardware for pannier racks). And for no more serious than I probably will be as far as long distance touring, this bike would serve the purpose. I will get some additional images on later today. CA you have a late 1971 early 1972 Super Corsa frame. 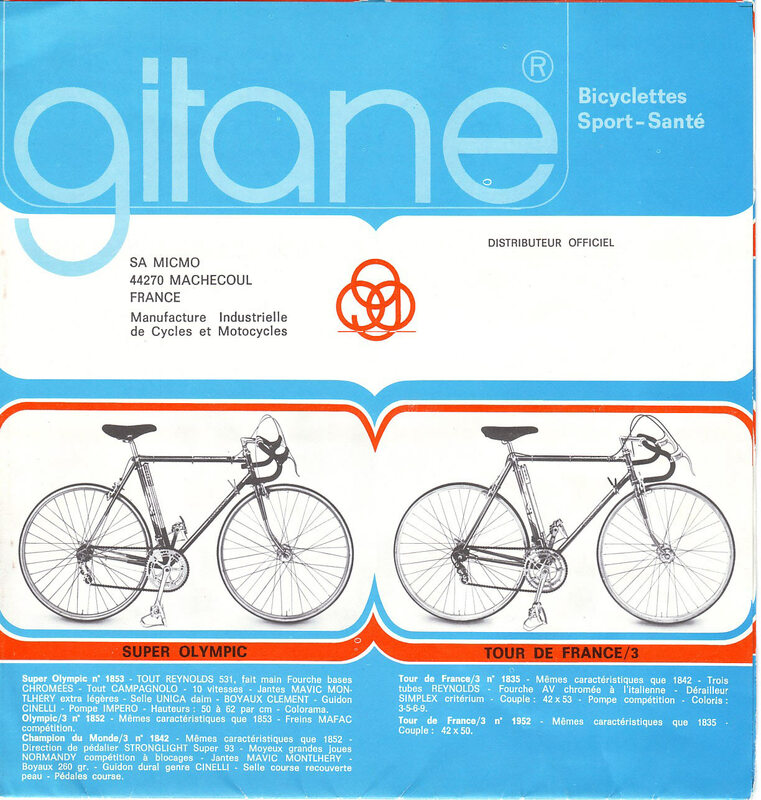 Gitane used Nervex Professional crowns on the Super Corsa and Tour de France models until ~1972. Until the early 1980's most European production bikes used heavier gage Reynolds 531 tubing. The butted ends of the main tubes had a 1mm wall thickness with .7mm in the thinner sections. That was the same dimensions as heavy gage Columbus SP tubing. The thicker tubes allowed for the employment of less skilled people because there was less of a chance of damaging the tubing from over heating. A frame that size is going to feel a little heavy but it probably weighs under 7 lbs bare. Super Vitus 971 and Columbus SL tubing was .9mm x .6mm wall thickness. Reynolds made 531 tubing with those dimensions too that Gitane occasionally used on some special models. Super Vitus 980 had .8mm x .5mm wall thicknesses on the main tubes. Super Vitus 983 was slightly heavier. A frame that size with a rider over ~175 Lbs. is going to have a smooth ride even with 1.5mm to 2mm thick gas pipe tubing. ie the Interclub and Gran Sport models. As far as ride quality goes, 57cm and smaller size frames benefit greatly from thinner tubing. Thanks Chas, Scott, here are some images of the lug work. I'm going to probably try to score a Stronglight A9 headset, although not period correct for this early '70 S.C. as a way to deal with the 38mm stack height. If I have to use the Stronglight P3 --I'll probably throw the spacer and/or brake cable holder into the Stack to make up for the excess. I wish I knew the story behind this 38 mm instead of the 41 mm. The frame alignment appears good when we checked it out at my LBS last week. I don't see any evidence in the existing frame tubing of damage around the head tube or elsewhere. It just makes me wonder if the correct (or original ) fork had been replaced due to damage at some point. So I'm not sure at this point how this frameset will evolve in my build plans. I do have another S.C. frameset that again I purchased back in 2011 that has been repainted (although sadly a lot of the original chrome socks had been covered and they had placed water bottle mounting points, and brazed additional cable guides as part of the custom paint job.) This frame does have a couple dings in the seat tube, nice chrome, just too bad they made the additions and customized the paint over the chrome socks. It really is a nice paint job !! Lug work on those early 70's Super Corsa and Tour de France frames wasn't pretty but it was well done. Bingo! It's probably a Champion du Monde frame which was a European model. The frames were the same as the USA only Super Corsa and European Olympic models except they used Stronglight P3 headsets with a 38mm stack height instead of the 41mm Campy. If the fork crown race is 27mm then it probably came with a Stronglight P3, if it's 26.4 it was Campy. Stronglight A9 headsets work well but French threaded ones may be hard to find and they'd have a 27mm crown race. My Local Bike Shop owner was kind enough to let me "Dry Fit" the Crown Race & head tube components. The fork and frame assembly came together nicely --5 complete turns of the locknut with the loose fit 5/32 ball bearings. I still want to try the Campagnolo headset--but it will have to wait (I forgot to take it along today). Anyhow, the 41 mm stack height of the Campy setup likely won't fit safely, BUT it is reassuring that I have a nice older Stronglight v-race design that will work. Dry fit of the bottom bracket & spindle with the Campy Veloce Triple crankset looks like it will line up. I'm waiting for the arrival of a Cyclus Bottom Bracket French thread tool from Italy to clean up some of the internal threads as the adjustable side cup is running into some interference (about 1-2mm shy of contact with the bottom bracket) So if I don't run into any chainline issues and proper function of the front Triple derailleur; then I'll get back to further paint removal. My hope for possible chrome repair at some shops in McPherson didn't pan out. (they only do industrial chrome plating now) BUT the owner did give me a suggestion of a resource in the Kansas City area for the decorative chrome plating of the fork ends and rear stays. Dry fit of the races, bearings, and cups and Hooray !!! it all fits, and again with plenty of threading for the lock nut. I still can't explain---at this point I'm just pleased that this restoration of the Super Corsa frameset will include the proper Campy headset. (my micrometer shows a difference of approximate 38.8 mm headset space with the fork and frame head tube) Again there is adequate thread exposure for probably at least 5-6 full turns of the top locknut. So it should be Safe. Part of me suspects the V-shaped Stronglight Competition headset may be the better design. Later, when final assembly happens I guess I'll have to decide about the Campy bearing set-up 20 + 20 w retainer or the option of 24 +24 5/32" loose bearings. Hey, Hope everyone had a great Thanksgiving Holiday and sharing time with your families. I spent some time cleaning up the bottom bracket threads on the Super Corsa frameset. This must have had some shallow threaded cups earlier. As I noted in my 11/9/17 post the R side fixed cup was shy of seating, and L side adjustable cup was easily 3-4mm shy of seating for correct bearing load. Left side appears to have had some sloppy paint or primer internally which I removed w paint remover and cleaned up with Cyclus BB French thread die. Great news and nice work on the bottom bracket. So what are the rest of the components going to be? G'day all, Tried to start this post last evening but image posting was stubborn, seems to be working this morning so here goes. First I hope everyone had a great Holiday Season with your families. We were especially blessed by our middle son finally being able to share Thanksgiving and Christmas with his family for the first time in 7 years and for that, I am most thankful. Any how, Thanks Scott for your reply to my Thanksgiving post and images demonstrating cleaning out some of the errant brazing material to allow bottom bracket cups to seat. I'm not sure how the total component package will develop but hoping to utilize the Campy devices that would be expected on a Super Corsa. With that said let me share my first attempt to utilize a Velo Orange French Thread sealed bearing bottom bracket assy with the Campy Nuovo Record Triple crankset ( 36, 42, 53 ). This was their French Thread 68 mm shell width, 118 mm axle length. Left side view of the adjustable cup seating. The assembly instruction are not clear as far as torque value---(I had only gently seated the adjustable cup and it was starting to make contact internally against the sealed bearing unit. The R side "fixed" portion of the sealed unit had been gently inserted but seated against the shell--it would seem the adjustable cup would land up slightly inside the shell when fully tightened)--- for the fixed and/or adjustable cups. The Velo Orange unit is well made and feels like a great option if you have crank arms compatible with JIS dimension. To me these arms even when eventually seated did not "Grab" enough of the spindle given the load they may eventually see. Also ---yes I need to correctly position the middle chain wheel when I clean and reassemble the crankset---it is reversed at this time-- obtained in that configuration when purchase this past year off of E bay. The JIS VS ISO taper fit---left side obvious and the R side was a little deeper but image doesn't really clearly demonstrate the shallow seating. This is a Suntour triple front derailleur---my future post will demonstrate the hopeful use of a Campy Euclid MTB triple for final component choice. There is a really nice chrome finish on the Velo Orange spindle design. Really the R Crank-Chainring needs to be further to the left---this chainline small front chairing to 5th sprocket, I had about 5mm clearance between Right Rear stay and the small chainring (the R crank arm was not fully tightened at these images only lightly seated w/o final torque) so I don't know how far the Crank arm would seat on the JIS spindle when finally completely tightened and how much of that clearance would be lost. Small chainring to 3rd sprocket and chainline looks pretty good---BUT if I understand the principle for triple chainrings the ideal would be from the middle chainring to the 3rd sprocket. Velo Orange supplies different spacers so you can move the unit outward on the drive side if needed in some offset situations. Their bottom bracket assembly looks well engineered. I like the sealed bearing unit and likely water resistance. As I noted above, these would be a good option if one was trying to come up with a replacement to the original loose bearing type bottom bracket. They even have a "Threadless" option if bottom bracket shell threads were not salvageable or useable---their staff member recommended the threaded version if at all possible. In my case I think the 113 mm length would improve the chainline (as noted the 5mm clearance with the 118 mm design) as R side would be further left with the narrower spindle. BUT I really don't know ---My concern again was really the shallow seating on the spindle with the ISO crankarm internal dimension. I have been watching for a Campy Triple 68mm spindle for a long time ---I missed a complete Crankset-Bottom Bracket assembly earlier this year. BUT right before Christmas some good Karma (albeit late night E bay adventure) came my way. I've used three of the 118mm VO French thread bb's on my early 70's PX10, mid-70's Gitane Olympic and 82 or 83 Vitus 979. I've had really good success with these bb's and would use them again. On all of them I have had to go with Japanese cranksets to seat better on the spindle. The Vitus started with a Mavic crankset and now has a SR crankset. The PX10 has a Sakae CR crankset. Finally, the Olympic has a Shimano 600 Arabesque crankset. Well, I did have some luck !!!! ---I've seen several of the Campy Triple spindles and/or bottom bracket assemblies this past year, but they were usually for the 70 mm bottom bracket shells. Right before Christmas, a NOS 117 mm width 68 mm shell triple axle became available. This middle chain ring to midline of Seat Tube approximates 43-44mm which I believe works with the 120 rear stay width and suggested 43.5mm chainline. Better seating of the Crank arms ISO square taper compatible with the ISO taper of the correct Campy spindle. Left side Crank Arm to L rear stay clearance, Drive side small chainring to Right side rear stay clearance, and Right side crank arm clearance with the outer edge of the Front Derailleur cage. This current set up is a 14-26 5 speed freewheel, utilizing Campy Euclid MTB triple front derailleur, and a Shimano Ultegra RD-6600 GS 9/10 speed long cage rear derailleur---and temporary set up with shifters on the down tube. It is working very smoothly fore and aft. This is large chainring to #1 sprocket---derailleur extension and clearance of jockey wheel to large sprocket. Rear derailleur chain take up, small chainring to #5 sprocket and clearance of jockey wheel to small sprocket. It would seem that a lot of folks agree that the Campy Nuovo Record front derailleur should handle the Triple Crankset. I don't know. I am going to try out some of my Nuovo Record derailleurs on this set up in the near future. I know this current set up will work and more importantly it seems to be very smooth in the operation. It seems that the Campy rear derailleur should handle the 14-26 freewheel as it does on many of my current road bikes. I'm not sure it would handle the excess chain. So, I think I have my headset, driveline worked out. I'm planning on using a new Nitto Technomic quill stem and to clean up and utilize a Randonneur handlebar that I had removed from Doug's '73 Interclub. (possibly with bar - end shifters---I think I like the cleaner appearance of the down tube shifters---but I understand the functional purpose of the BarCon type shifters on the touring bike setup). New seatpost and likely a Brooks saddle. I'm not entirely sure about that saddle choice. My backside really likes the Sella Italia Max Flite gel flow saddles---but the classic Brooks probably has to be used given the touring appearance and function that I hope to set up. Possibly I'll try to utilize the wheelset from my '72 Super Corsa (that set of 27" clincher wheels was requested by the original owner when he purchased it from Burgess Cyclery and that is what has been pictured in this series of images). I've replaced that wheelset with the proper 700c tubular wheelset for the '72 Super Corsa. In thinking about possible fender options for this proposed touring rig, the usage of 700c wheelset would probably help with tire-fender clearance issues. Stopping power likely will come from Campy brakeset. The next issue, as noted previously is trying to see if I can have the Chrome on front forks and Rear triangle restored-refinished---I'm still trying to get some help from a resource in the Kansas City area to do that. I may just have to clean up the existing Chrome w it's patina ---BUT the front forks really need a new finish (I suspect the previous owner of this frameset "roughened up" the forks to enable better paint adherence when the chrome forks were painted over. With warmer weather predicted this weekend--I probably will remove the driveline components and finish the last bit of old paint removal. Any thoughts - comments Pro--Con about bar end shifters ---I have a set of BarCon shifters I purchased years ago. Interesting EBay item this weekend for some Campagnolo Bar end shifters "too rich for me" bidded up to almost $100 with shipping. G'day everyone. It has been a while just to update slow but steady. Finished the balance of the paint removal and heading with the frame to Kansas City area to hopefully make arrangements for the removal- replating-polish of the chrome. So the good news after returning from the weekend at the Midwest Dental Conference, is that the Chrome replacement - project is a go ---but anywhere from 2-3 months before it likely will be completed. So, in the spare time attention will be turned towards cleaning-polishing of the balance of the components, making a final decision on the paint color, and tracking down some of the touring components.